The greatest weapon in the government’s repressive arsenal is the snitch. These sorry examples of humanity provide big brother with an insider’s view of communities of resistance, spread fear and distrust in revolutionary circles, and gift law enforcement with profiling tools to find likely dissenters in the future. Dealing with this problem is one of the most difficult challenges of a militant movement. 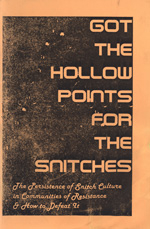 While the title of this zine (Taken from Dr. Dre’s Let Me Ride) may seem like unnecessary posturing, the contents contain an intelligent examination of the historical role of snitches, how other movements have dealt with them, and a rogues gallery complete with contact information for dozens of traitors. Written during the early days of the Green Scare, it offers a look into the mindset of frontline activists during a time when snitching was epidemic. TALON is a shadowy collective of archivists and media soldiers hellbent on advancing their ZINESTORM master plan! Soon our JACKAL minions will flood the streets, the old order will fall, and liberty will flourish for the entire biological community! TAAAAAAAAAAAAAAALOOOOOOOON!!! The Talon Conspiracy is an online archive preserving the history of protest movements for animal rights and environmentalism. Its owners, contributors, and designers are not responsible for actions taken by third parties which may be harmful or unlawful to the individuals or entities named in archived publications. This web site is provided for the purpose of historical research and analysis, and is not intended to incite, encourage, or condone any criminal action on the part of its readers. 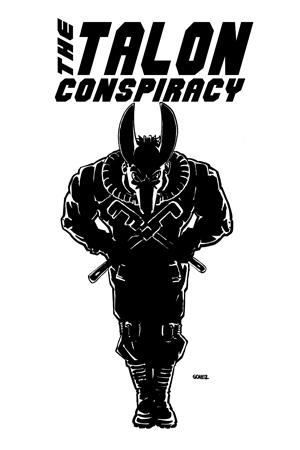 Finally, The Talon Conspiracy does not necessarily agree with any of the views expressed in the publications in our archive, but aims to provide a thorough collection of the history of eco direct action. All opinions expressed in our archives are those of their original authors only. Subscribe to the ZINESTORM and be alerted of updates!